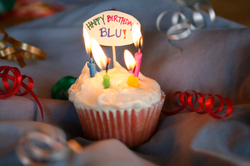 Blu's Daily Blog: Happy Birthday Blu! "I need blu, like the flowers need the rain, you know I need blu." Happy Birthday Blu!!! Where are the new templates?